Technology has changed and improved the customer experience over time, but the most recent transformation with the growth of augmented reality is sure to lead to greater change than ever before. 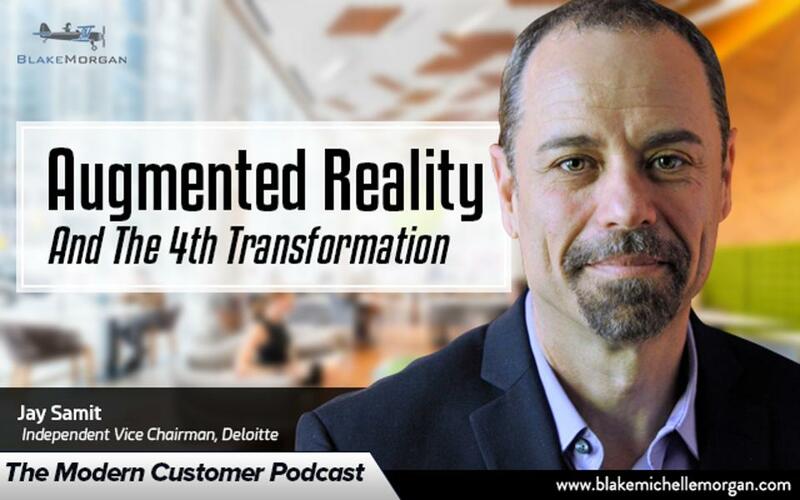 According to Jay Samit, Independent Vice Chairman at Deloitte, augmented reality has the power to revolutionize customer experience in every industry. Our modern world has connected us with devices like smartphones, which puts a world of possibility right in our pockets. But even with smartphones we still have to search for answers. Instead of customers having to seek out information, that knowledge can now be embedded in the environment in a way that anticipate customers’ needs and helps them find solutions where they already are. Imagine a world where you can wear glasses that look just like normal glasses but that have AR technology that can be customized to match your lifestyle and provide the most applicable information. According to Jay, these glasses are right around the corner and will make it much easier to incorporate AR. Instead of getting lost in a store, AR could light up a path on the ground to get you to the item you need. AR could also help customers see inside a resort before they book and provide glimpses into what the view and accommodation would be like or instantly translate a conversation or signs when users are traveling abroad. AR could also transform the in-store experience by having coupons or product recommendations pop up depending on where customers are in the store and what items they are looking at. Companies around the world are already implementing AR and seeing great results in customer experience. A zoo in Japan has created an augmented reality experience where visitors can use their phones to see a path show up on the streets to get them from the subway stop to the zoo. It’s a fun way to make things easier for customers instead of them wandering around until they find the zoo. Beauty counters have also seen an influx of AR-powered mirrors lately. The technology allows users to virtually try on makeup and see how it would look on their face, plus the mirror remembers what a customer has used and can recommend products based on their preferences. Over the last few years, there has been a huge growth in customer experience online. However, AR has the power to surpass the internet and offer a better experience than customers could ever get online. Things like virtual inventories, side-by-side comparisons, and being able to see things in 360-degree views will totally change how customers shop and interact with brands. Instead of having to go into a store to try items on and ordering things online and hoping they fit, AR will allow customers to try things on virtually, see them from every angle, and easily compare them to other items. Augmented reality is immersive learning that hits customers at a different level. It is the extra things that anticipate needs, improve problems, and make interactions with customers just a little bit better. AR is being able to get what you need when you need it and creating seamless experiences that make life easier, more efficient, or more enjoyable. The future of customer experience is strong, and it’s due largely to AR.